Starbucks new store design made out of used shipping containers. With more than 19,000 locations in 62 countries, Starbucks is stirring things up a bit with a new store design made out of used shipping containers. The recently-built Chicago location is the chain’s fifth location incorporating used shipping containers, all part of a company-wide effort to reduce the giant coffee retailer’s carbon footprint. The first such project was a LEED-certified container store built near the company’s U.S. headquarters in Seattle two years ago. Whilst the Chicago store used six shipping containers, the company’s smallest modularly designed store is built out of one 40-foot container and an 8-foot mini-container. The 700-square-foot Chicago store is a walk-up or drive-through unit, so there is no indoor seating for patrons or WiFi access to the internet as most of its other free-standing locations offer. However the store does offer a large patio in front with some outdoor seating. The company says the idea to set up shop in shipping containers came from the company headquarters that overlooks the busy port of Puget Sound with its rows upon rows of stacked shipping containers – the same kind Starbucks uses to import and export its coffees around the world. The Chicago store took a few hours and a crane to unload the modified shipping containers and bolt them to the foundation. Most of the store’s design was completed at a fabrication plant in California before it was transported to Chicago. Its location at Broadway and Devon in the Windy City makes it particularly handy for students from nearby Tricoci and Loyola universities to drop by for a sophisticated cup of joe. Other “green” features of the store include a roof that catches rainwater and funnels it to the store’s landscaping. The store also has an exterior covering made out of reclaimed materials. And even the famous Starbucks sign is fashioned from the steel of a shipping container. 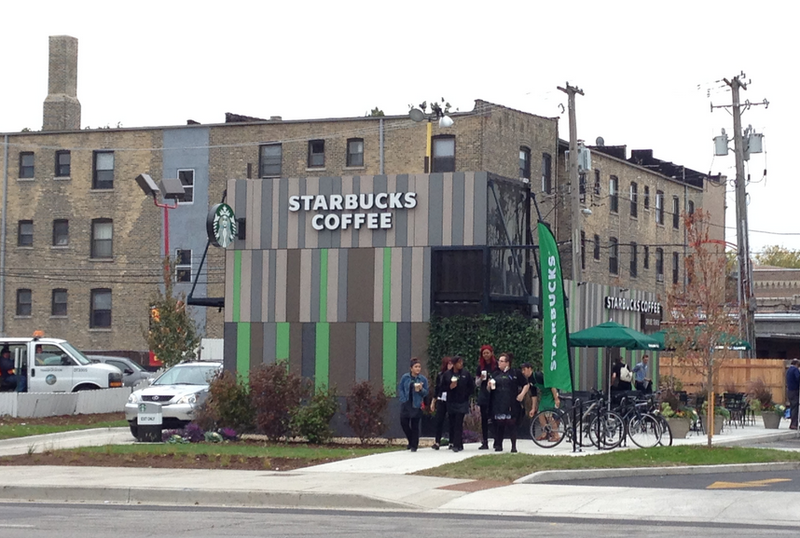 This is a great idea for Starbucks – or any company for that matter – to use shipping containers at the core of their design to not only save on construction costs, but to demonstrate their support for more sustainable building practises. If you too have an idea to reduce your companies carbon footprint and think that a modified shipping container could be the solution contact Containers First today. Call 1300 556 991 or click here to contact out team. New shipping containers prices – Not Just a box!! The container arrived today as planned and looks great, thank you. The main reason for this note is that I want to put a few words in for Brendan. I was very impressed with his courtesy, friendliness and professionalism. You have an excellent driver there. Thanks again, for beaut service. Don’t See What You Need? We can definitely help! Pick up the phone today and call us on 1300 556 991 and our friendly team will help you find the perfect shipping container for your needs or you can CLICK HERE to contact us. Our depot is conveniently located for easy access from the west of Sydney: 23-25 Gould Street, South Strathfield NSW 2136. If you can not get to us DO NOT WORRY, our team can send you photos of the containers and help arrange transport.